Transform Haiti’s Educational System: Is it Possible? Categorized as: Caribbean, Education, Girls & women, Grantee, Our Partners, Stories, Youth on June 4, 2016. Related Grantees: Asante Africa Foundation, Advancing Girls Education: AGE Africa, Batonga Foundation, Cooperative for Education, Hand in Hand, JAAGO Foundation through the Jolkona Foundation, The School Fund, Tomorrow’s Youth Organization. Anseye Pou Ayiti (Teach for Haiti) is a grantee partner of the Skees Family Foundation. Our Program Director, Sally Skees-Helly, recently met founder Nedgine Paul and learned more about her inspiration and drive to create real change in Haiti’s educational system. It was an honor for Sally to spend time with this dedicated and capable social entrepreneur, named by Forbes as one of their 2016 “30 Under 30” Social Entrepreneurs. Anseye Pou Ayiti recruits teachers in Haiti and sends them on a transformational two-year journey of education and leadership development. They create education ambassadors dedicated to upending the current norm of the non-completion of primary school within the island’s most underserved populations. With 43 percent of Haiti’s population under the age of fifteen, and an average of only five years of formal education received by this population, Haiti’s educational system could use some transformation. Anseye Pou Ayiti believes that a quality education is a human right and that Haiti’s future depends upon a population that graduates its youth fully prepared to engage as Haitian citizens and contribute to society, including instilling a deep pride of their local culture, customs and community. APA believes a quality education is a human right and vital for the future of Haiti. Founder Nedgine Paul, born in Haiti, moved with her family to Connecticut when she was just four years old. She credits her parents for instilling in her a deep connection to her country of origin. It’s not surprising that, as an educator, she saw the need for educational transformation in the place she loved and set out to do something about it. You can hear more of Nedgine’s story in her interview with Tony Loyd. APA annually recruits local Haitian educators and college graduates. Nedgine explains here. Candidate applications went from 238 in 2015 to 441 for the 2016 cohort. These teacher leaders are placed in existing primary schools in underserved communities. The recruits complete an intensive four-week Summer Immersion program followed by a two-year transformational teaching and leadership fellowship taught through development modules and individualized coaching. After the program is completed, these teacher leaders remain connected to APA as Alumni Ambassadors, providing leadership support and spreading the model throughout their communities, expanding impact and raising educational outcomes. In 2015, APA’s first cohort of thirty teacher leaders began a life-changing, two-year fellowship. Check out their many highlights, including impacting over 650 students in four underserved communities. 7 Classrooms with 2015 cohort leaders show over 90% passing rate by Q3. Statistics provided by Anseye Pou Ayiti. Anseye Pou Ayiti is also a formal, independently operating partner with Teach for All. APA expects to expand its program to 250 teachers reaching over 16,000 students within five years. 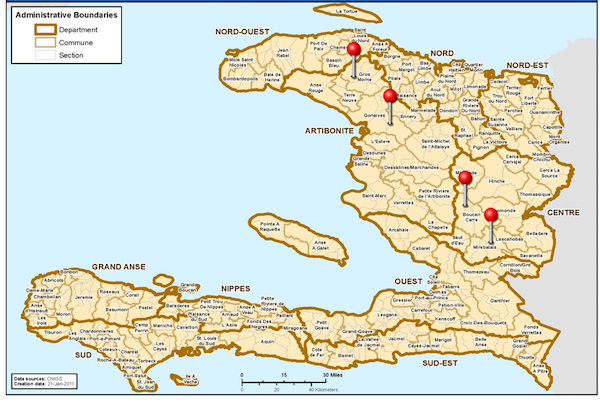 2015’s Cohort of thirty teacher leaders served four communities in Haiti. According to Nedgine, these ambassadors effect change not just within the student population, but throughout their local educational community, including teachers and administrators. They are taught to be leaders in policy change throughout the spectrum of education, improving everything from curriculum to nutrition. They are also equipped with the knowledge, skills, and mindsets to lead transformation. APA just completed a matching grant fundraising campaign and surpassed their goal, perhaps in part due to the support of pop singer, John Legend, who wanted to raise awareness about the need for local, contextualized models of change and investing in a new generation of local leaders. Photos courtesy of Anseye Pou Ayiti. Video courtesy of YouTube.